I will openly admit that Alexander Vinokourov is one of my all-time favorite riders, but I also loved to watch Armstrong in his day, and have a soft spot for Alberto Contador. Can you spot the similarities? I don’t like dopers: I just don’t discriminate. And so it was with great amusement that I read the following statement from Vino (suspended once for blood doping and charged once with corruption) this morning concerning the Iglinsky brothers being busted for EPO. This guy needs to go into politics if he can whip off a statement like this with a straight face (then again, I’m not sure I’ve ever seen anything other than a straight face from him…). 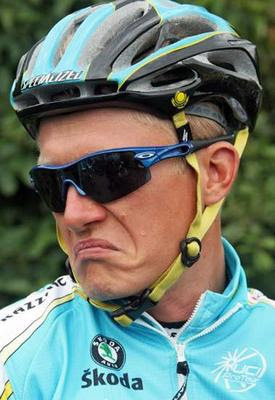 All Astana Pro Team riders are contractually obliged to respect strict ethical rules and regulations,” said Vinokurov. ”We will not tolerate any indulgences by any one entity, person or structure that violates these rules. I am very disappointed and angered that this rider could not have understood the basis of our rules and the importance of our ethics. “It is especially unacceptable on the part of a Kazakh rider who stands for the image of our team and the image of our country. Pro cycling. Never a dull moment! Doing a good job, maybe, but his cred must be below zero after his history. Sorry to hear about your crash, especially on a brand new bike! I’m glad both rider and ride are doing well. In other news, the tobacco industry has publicly condemned sunlight for causing cancer. a history of Buying races (busted by emails ).doooh!.. rode like an speedfreak wired on crack.